What Is The Porsche Motorsport International Cup Scholarship? An opportunity for talented drivers already competing in Porsche's international one-make series across the globe to take the next step and advance into Porsche Mobil1 Supercup along with funding of 200,000 Euros. Porsche's motorsport engineers and factory drivers evaluate 8 drivers as they compete against each other in the new 2014 Porsche 911 GT3 Cup. 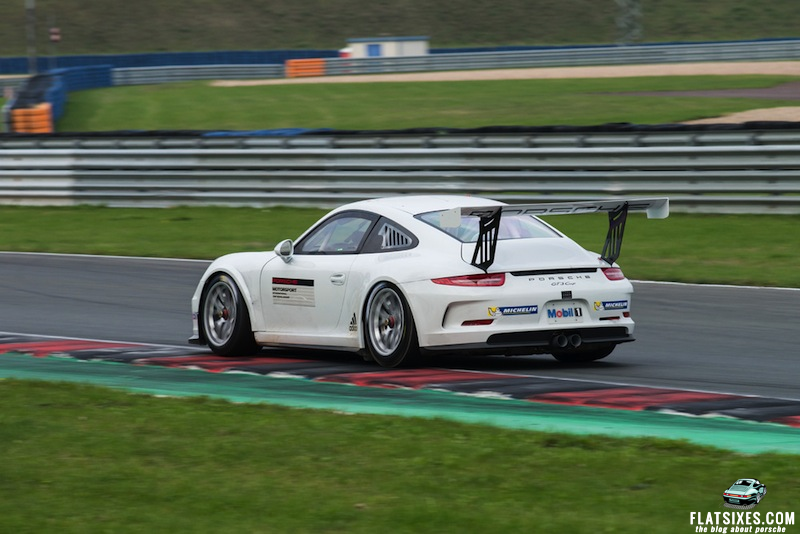 Over two days, the successful brand trophy pilots had to set not only the fastest possible lap times on the 3.7 kilometer race track but also demonstrate their technical understanding and analytical skills in setting up the 460 hp GT race car. Seven Porsche one-make race series nominated their most promising pilots aged up to 26 years to take part in the shootout. Earl Bamber represented the Porsche Carrera Cup Asia, with Maxime Jousse racing for the Porsche Carrera Cup France, the home series of last year’s scholarship winner Jean-Karl Vernay. Alberto Cerqui competed for Porsche Carrera Cup Italia, with Porsche Carrera Cup Japan sending Ryo Ogawa. Porsche Carrera Cup Great Britain put forward two candidates, Daniel Lloyd and Jonas Gelzinis. Representing the Porsche Carrera Cup Scandinavia and the GT3 Cup Challenge Central Europe, the national title winners Johan Kristoffersson and Christofer Berckhan Ramirez were two more hopefuls in the selection process. This year marks the second time that the Porsche Motorsport International Cup Scholarship will be awarded. The winner will not only race in the Mobil1 Supercup, they gain the chance to switch into international GT and prototype racing series. Several previous winners represent Porsche worldwide as works drivers in major race series. Why Does Porsche Engage in Motorsport? Sir Mix-A-Lot’s Porsche For Sale. It’s Got Some Serious Back!